On September 16th Gallaudet University (GU) held an open community meeting to introduce the 6th Street and new Campus Gateway design competition and to explain how community members can be involved in the Shape Gallaudet process. GU owns parcels to the north and south of the Union Market building and warehouse. 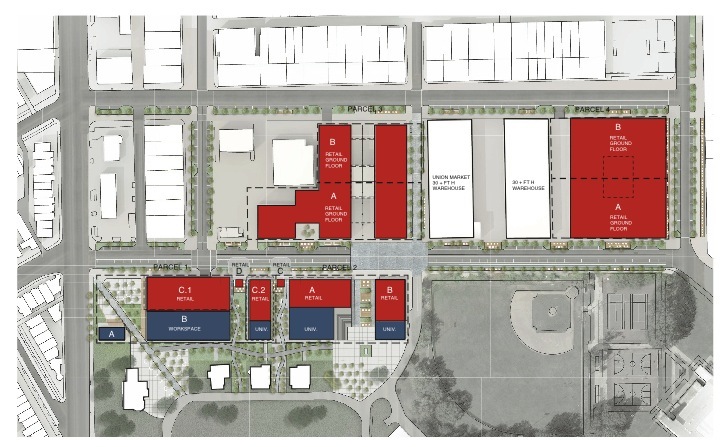 Those parcels and areas inside the GU fence along 6th Street (where garages and the motor pool are located along with other maintenance/grounds keeping spaces) are to be redeveloped with mixed-use space designated for retail, creative, cultural, and university use. While the focus is on the west side of campus, it is important for Trinidad residents to provide insights as GU works to redefine its urban edge and integrate more closely with the surrounding communities. We have opportunity to, or do, interact with the campus environment daily. We live next to, or are, current or former students or staff. There are two ways to become involved. The first is to enter the competition with a design team. The second is to provide “ideas, inspirations, sketches, images, and videos… The finest of these will be used to inform the briefing to be given to the design teams shortlisted after the first stage.” You can find details on submitting Shape Gallaudet ideas or entering the design competition on the design competition website. The deadline for submissions is October 1, 2015. The more robust the input the more the final gateway design will reflect an open and inclusive character that integrates into the broader neighborhood. A copy of the presentation is attached to provide additional information (Community Announcement PPT Final) and you can read the announcement here. Posted on September 19, 2015, in Development and tagged Design Competition, Gallaudet. Bookmark the permalink. Leave a comment.